In a landmark cinematic and television event, the newly restored version of Oscar®-winner Marcel Ophüls’ 1976 documentary THE MEMORY OF JUSTICE will be presented MONDAY, APRIL 24 (5:00-9:45 p.m. ET/PT), Holocaust Remembrance Day, on HBO2. Following the film’s restoration by the Academy Film Archive and The Film Foundation, the rarely seen epic was presented at the Berlin, Toronto and New York film festivals in 2015. This HBO2 presentation marks the world television premiere of the restored version. 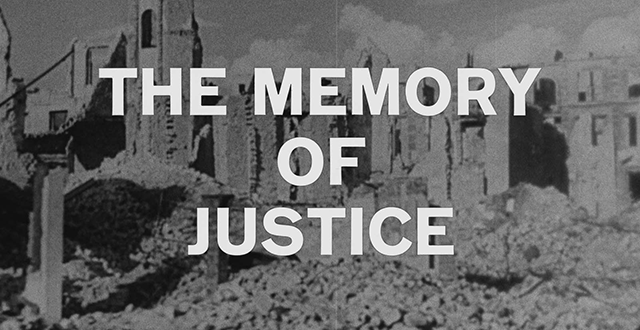 THE MEMORY OF JUSTICE explores the relationship between individual and collective responsibility, as Ophüls investigates then-recent alleged war crimes committed by France in Algeria and by the U.S. in Vietnam in light of atrocities committed by the Nazis. The director was inspired by the 1970 book “Nuremberg and Vietnam: An American Tragedy,” by Telford Taylor, a counsel for the prosecution at the Nuremberg trials, who became a harsh critic of America’s escalating involvement in Vietnam. Filmed 30 years after the end of World War II and the Nuremberg trials, the film draws on the unique perspectives of those who lived through the conflict and those who came of age afterward. THE MEMORY OF JUSTICE features rare archival footage and interviews with both victims and architects of atrocities, raising essential questions about the moral choices made by individuals and governments in the latter half of the 20th century that are equally relevant today. After years of research, The Film Foundation and the Academy Film Archive discovered an original, unlabeled, 16mm camera negative of THE MEMORY OF JUSTICE in a studio vault, and worked closely with Ophüls and producer Hamilton Fish on its restoration. Newly discovered original recordings of Ophüls’ interviews with French and German speaking interview subjects were restored and substituted for the existing English-language voiceover tracks. New subtitles in English, French and German were created for the restoration so that the participants’ own voices can now be heard, along with Ophüls’ questions. THE MEMORY OF JUSTICE was written and directed by Marcel Ophüls; produced by Hamilton Fish, Ana Carrigan and Max Palevsky. Michael J. Davis served as director of photography, with editing by Inge Behrens and Marion Kraft, and sound by Paul Carr and Anthony Jackson. The film was restored by the Academy Film Archive in association with The Film Foundation and Paramount Pictures, with restoration funding provided by The Material World Charitable Foundation, Righteous Persons Foundation and The Film Foundation.